Our church is hexagonal in shape with seating for around 190 on upholstered pews. The Communion Rail and Table are circular, to emphasise the `togetherness` of participants and are made of stainless steel, as is the alms dish which is in the form of a shell. The Scallop Shell is a symbol of pilgrimage and also stands for the apostle James` zeal and missionary spirit. Behind the rail is a semi circular coloured window beautifully designed and constructed by King & son of Norwich, specialists in Stained glass. Above the Table is a central light with twelve surrounding lights which represent Christ and his disciples. The Pulpit is in the form of a prow of a boat. 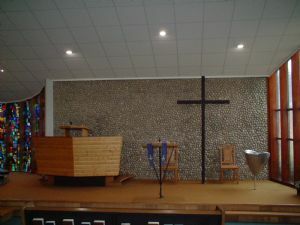 The wall behind the sanctuary is of pebbles and was built by a local man. `Stone picking` was (and still is) banned on Sheringham beaches, so the flint stones used in this wall have come from other beaches in North Norfolk. The carpets in the Church also have significance. Blue in the main body of the church and gold at the front represent the sea and beach. The Choir Stalls are at the side of the building thus allowing the choir to be part of the congregation. In 2003 the original organ was replaced with a three manual digital organ with 9 external amplifiers and loudspeaker channels, custom built for St. Andrew`s by Hugh Banton of Lymm, Cheshire. 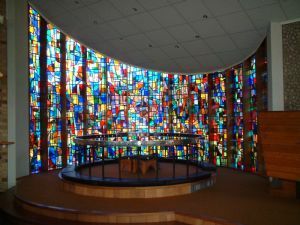 The church`s lighting is designed to reflect from the ceiling. 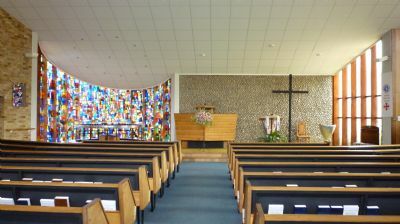 The walls of the Church worship area are each made of a different type of building material – bricks, glass, wood and pebbles. 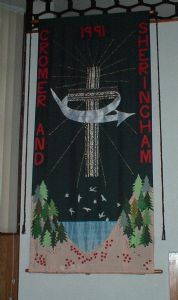 Church Silver Jubilee Banner. It was designed and made by a group of 10 ladies to commemorate this special occasion. At the bottom can be seen the two former Chapels, and a boat representing the strong connection which the chapels had with the fishing families of the town. Central on the banner is the St. Andrew`s logo, within the two circles forming the Communion Ring. The stained glass window is portrayed in the top corners, with the Holy Spirit represented by a white dove. Revd. Kathleen Richardson when she visited the Church to launch our Silver Jubilee celebrations. The Circuit Banner on the right was made by a Group mainly from St. Andrew`s, for the District Day in 1991. The theme was `Moving In – Moving On`. 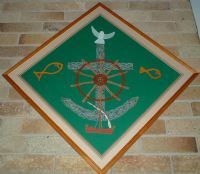 The central Cross and arrow represent the movement of the Holy Spirit, and the rays spreading out from this portray the influence of the Cross over our area, `twixt sea and pine`. This is depicted in the lower half of the banner by hills, trees, sea and gulls. The poppies are a reminder that this area is known as Poppyland. The Holy Land Banner was presented to the Church in 2000 by Father Michael Sellors, Dean of the Cathedral Church of St. George in Jerusalem. The design of the banner has the word “Jubilee 2000” in English and Arabic, and “Christ yesterday, today and always” in Latin around the motif which in its centre has four interlocking doves, symbolic of peace. The word “Peace” is given in English, Hebrew and Arabic under which is the Jerusalem Cross. This cross is in fact five crosses – the large one symbolic of Christ`s wounded side, then two for the pierced hands and two for the pierced feet. a ship`s Wheel, and an Anchor, a sign of hope and security. There are also items from the two former Chapels. The carved Communion Table in the Poppy Room is from Station Road, and the one beneath the Stone cross in the Vestibule is from Beeston Road. The hymn boards in the Church also come from these Chapels. The sign of the fish and the cross can be seen on both sides of the handles on the main outer doors of the Church. A 50ft. Tower stands at the entrance to the Church and is surmounted by four stainless steel crosses which were bought by the Youth Club when the Church was built. This tower is floodlit, and can be seen from the sea. Speakers for the relaying of recorded bells are positioned on the outside of the Church, and these can be heard prior to Church services and after weddings. The large colourful mosaic by the entrance depicts the confusion of the present day world, but, on a closer look the cross is clearly discernible everywhere proclaiming its relevance to today`s needs. On the wall in the Small Hall can be seen an embroidered table-cloth. This was one of the many ways in which money was raised to build St. Andrew`s. 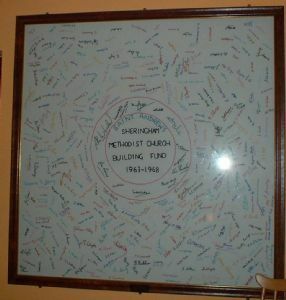 The Youth Club at that time decided to ask people to donate 2/6 (12½p) to have their name on the cloth, and as can be seen by the signatures, even sent the cloth to the presenters of a television programme to sign.